Smoking can cause and worsen a variety of health complications. 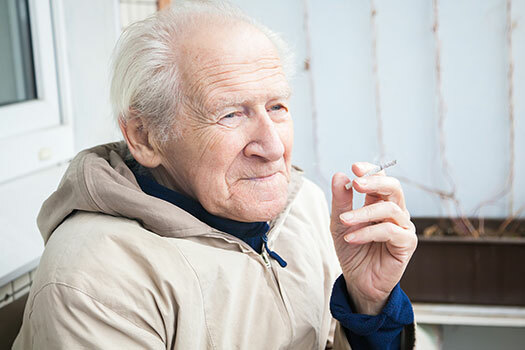 From lung cancer to heart disease and high blood pressure to respiratory illnesses, seniors are already at a greater risk for developing issues that can be impacted by smoking. If you have a senior loved one who smokes, you can help him or her stop now with the following tips. Quitting smoking is difficult, but providing positive reasons to stop can get the ball rolling. Remind your loved one that giving up cigarettes can increase longevity, save money, and have a positive impact on the rest of the family, particularly children, grandchildren, and younger people who may not want to be around smokers. Focus on how your loved one’s life will change for the better, and zero in on the aspects that will have the biggest impact on him or her personally. For example, if your loved one is worried about finances, calculate how much money will be saved if he or she stops smoking. In Victoria, home care agencies can be a great boon to seniors. With the help of the caregivers at Home Care Assistance, your aging loved one can lead a happier and healthier life. We offer a revolutionary program called the Balanced Care Method, which encourages seniors to eat nutritious foods, exercise and socialize regularly, and focus on other lifestyle factors that increase life expectancy. If your loved one only likes to smoke around certain people or in certain locations, it may be time to avoid those things. For example, if your loved one only smokes with a certain group of friends, maybe it’s time to cut back on spending time with them. If he or she only smokes when going to a restaurant, maybe it’s time to eat at home for a while. There are many counselors and support groups for smokers. Look for something in your area, and make sure your loved one has transportation to get there if necessary. Also, make sure your loved one is comfortable in the setting, especially if you choose a support group. Make sure your loved one has healthy snacks around at all times. When your loved one feels the need to smoke, he or she can opt for a healthy snack instead. Many smokers have found snacking helps them stay away from cigarettes, especially in the beginning. Keep snacks in nightstands, purses, pockets, cars, and beside favorite chairs. If food doesn’t serve as a good distraction, finding a hobby that keeps your loved one’s hands busy might do the trick. Playing an instrument, gardening, volunteering, collecting, playing sports, reading, painting—any of these activities and more may keep your loved one’s mind off smoking. Focusing on a hobby can also prevent boredom and depression and boost cognitive health. Many seniors need help performing mentally and physically engaging activities, and some also require assistance with the tasks of daily living. If your aging loved one needs occasional help with bathing, grooming, cooking, or other basic household tasks, or if you need time to attend to important personal matters, reach out to Home Care Assistance, a leading provider of live-in and respite care. Victoria seniors can maintain their independence while living at home with the help of our reliable respite caregivers. If your loved one really wants to quit but is having a difficult time, enlist his or her primary care physician. The doctor can provide a list of ways to stop smoking, prescribe medication, refer your loved one to a specialist if necessary, and provide information about support groups in your area. Quitting smoking is a huge step toward maintaining a healthier lifestyle. If you have a senior loved one who needs help maintaining a high quality of life while aging in place, reach out to Home Care Assistance, a leading provider of home care Victoria families can rely on. All of our caregivers are bonded, licensed, and insured, there are no hidden fees, and we never ask our clients to sign long-term contracts. For more information or to schedule a free in-home consultation, contact our dedicated Care Managers at (250) 592-4881 today.